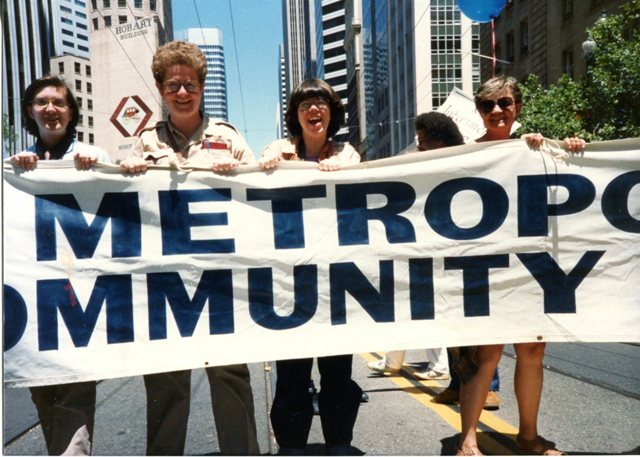 Kittredge Cherry, second from right, at the Lesbian and Gay Freedom Day Parade in San Francisco, on June 29, 1986. Her partner Audrey is third from right. My partner Audrey and I had recently moved to San Francisco after a rough coming-out process with our families and friends. 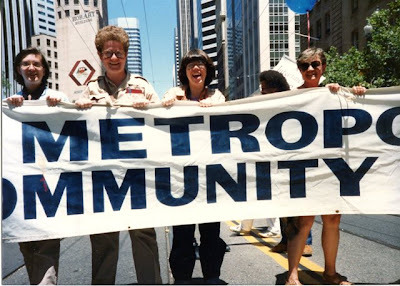 We found a new lesbian- and gay-affirming community by joining Metropolitan Community Church of San Francisco. But we were still afraid when our new friends invited us to march in the Freedom Day parade with them. We were held back by the years spent hiding our love in closets of shame. We told our friends that we would watch the parade from the sidelines. When the big day came, I was stunned to see queer people of all kinds proudly marching by the hundred while thousands more clapped and cheered. The people in the parade showed me a seemingly endless variety of ways to be gay, from “dykes on bikes” to outrageous drag queens. News reports estimated the crowd at 100,000. It seemed like LGBT people had taken over the whole city, marching down Market Street while rainbow flags hung from the street lights all the way to City Hall. We ran into the street and grabbed the banner. My heart soared. A friend snapped a photo to record our joy. It truly was Freedom Day, the day that this lesbian broke free of shame and learned to let her love shine. The smile on my face says it all: I'm free to be me! 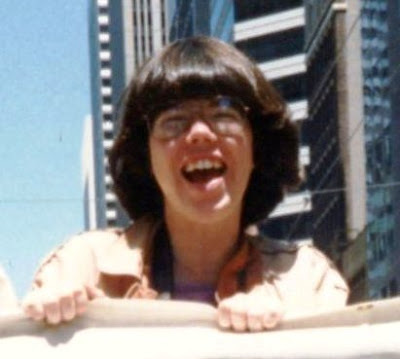 My first Pride march was in Atlanta in 1979...I have no photos, but I'm sure I looked much younger then...And of course, there was the "Big One" in DC the following October. Thanks for sharing your "first Pride" memory. I missed the "Big One" in in DC 1987, but did have an unforgettable time at the 1993 March on Washington for LGBT rights.